The Grateful Bears Project is a labor of love, wishing to make a difference on our fragile planet. Both Doug Bratt's and Laurie Bethell's goal is to share gratitude and compassion through these plush, wide-eyed bears. Each collectable bear, in a series of 108 numbered bears, will be made in the likeness of a philanthropic individual with notoriety, with 100% of the profits going to each individual bears charity of choice. Both Doug and Laurie assert that by helping others less fortunate, the world becomes a better place. Doug and Laurie met in a healing arts class in 2011. 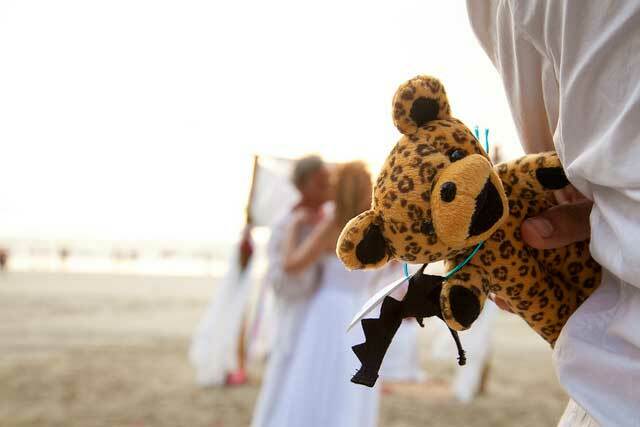 They wed on a secluded beach in Costa Rica two years later. It was at that ceremony that the inspiration to create a new line of bears was birthed. Fast forward five years and the first Grateful Bears are now available for purchase. Sign up today to be on the notification list for all 108 Numbered bears. We wish to thank all of you for your love, your patience and your never ending support in this magical carpet ride called Grateful Bears. "Sometimes the little things are actually big things...in disguise."